Last time in Italy I purchased an Italian cell phone on the hood of a taxi driver’s car on the recommendation of my driver in Positano…a friend he said and a “good guy”. 40 euros later I had a brand new phone with a headset and charger. Next to the TIM store to buy a SIM and phone time. I was set. Well not quite. Instructions came in Italian and I couldn’t even turn on and off the phone. I’m limped my way through and it was good in emergencies but not the tool I imagined. Fast forward 2 years and as I was preparing to depart for Italy I took out the phone and of course the battery was dead. EBay to the rescue in with a new battery installed I Googled the phone brand and model and voila found a English translation of the owners manual showing me a diagram of the phone. Now I know what the buttons do and can manage answering a call and making a call. It’s when I don’t catch the call it goes to voicemail and then I get a message all in Italian with a number at the end. Am I paying to get message? How do I text and retrieve a text? Is that costing me on my calling time? Actually I’m no more frustrated than going to the AT&T store before departing to ask what to do to avoid International charges. So when in Rome…I have a cute red mobile phone so am feeling more like an Italian but wait….they all have iPhones and Droids so mine looks like a collector’s item. By the way, the iPhone 5S was going for 795 euros for a 16GB! Mamma mia! 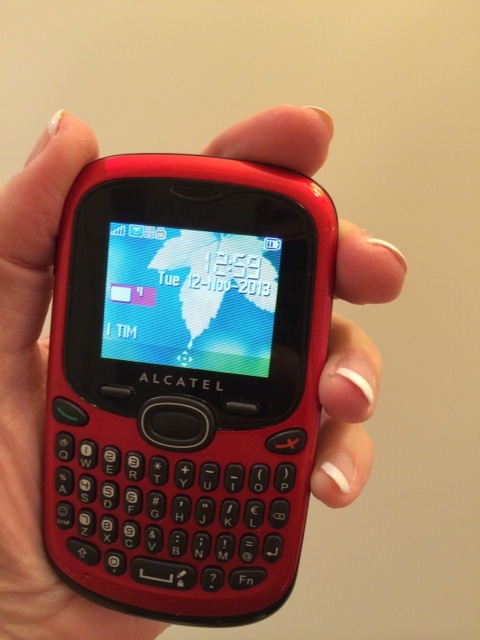 My Italian Cell Phone…or I should say, "Mobile Phone?" Call me!